Whether we’re off to discover a new hiking trail or just traveling a few miles up the road to visit Grandma and Grandpap, summertime means more trips in the car with Haley. She loves going everywhere with us, but we don’t particularly love all the hair, mud and mess that’s left behind in the Jeep when we get back home. Over the years, we’ve discovered these tips for keeping your car clean when traveling with a dog. Well, “cleaner” at least! If it’s shedding season or your dog is a nervous shedder when riding in the car, brush or comb your pup before leaving the house to keep excess hair out of your vehicle. If you have multiple cars, pick one to be the dedicated dog hauler so you only have one car to clean and deodorize. Our older Jeep Liberty has become our dogmobile which keeps the other vehicles fresh and fur-free. Whether you use a crate, seat-belt harness or just keep your dog in the back area of your vehicle, containing your pup in a smaller area means less mess and hair to clean later. Check out Barbara’s recent post on K9s Over Coffee for some safe options for restraining your dog in the car. We’ve always had leather seats in our vehicles which make cleanups easier, but a dog’s toenails can still scratch the leather. Invest in a durable seat cover to protect cloth or leather seats and to keep mud, hair and other unmentionable messes contained. Most seat covers are easy to install and can be easily removed and washed when dirty. Hammock-style seat covers, like this one by Plush Paws, not only protect your seats and floor mats, but they also prevent your dog from falling into the floorboard area if you brake unexpectedly. SUVs and dogs are a perfect match! I lower the back seats so Haley has plenty of room, then I cover the carpeted area with a heavy, twin-sized quilt. The quilt stays in place well, keeps her hair from getting embedded in the carpet fibers and absorbs any mud or water if she gets wet while hiking. It can be easily removed and washed when needed. Rubber-backed bathmats can be used for smaller dogs and nothing beats WeatherTech floorliners for protecting floorboard carpet. For even more protection, cover carpeted areas with the clear, adhesive carpet film you often see used in model homes. Who’s going to clean this mess? Not Haley! While on the road, it’s handy to have these items when you need them: Paper towels, pet wipes (especially if your dog likes to roll in nasty-smelling things), microfiber towels, a slobber cloth (for drooling dogs), plastic bags, dog brush or comb, lint brush (for you), tick-remover tool/tweezers and a spare bottle of water. If your pup is a heavy shedder, have them wear a lightweight t-shirt while traveling in the car. Gather the loose area of the shirt around their lower belly, twist the fabric, and tie into a loose knot so it fits well. It may not contain all the dog hair, but it will prevent most of it from flying around inside your car. After hiking, clean your pup before getting back in the car. Brush off any loose dirt, use the spare bottle of water to rinse muddy paws and towel off their fur to remove any excess water. If you’ve been hiking in an area where ticks are common, comb through your dog’s fur and check for any of those nasty critters. This is a no-brainer, right? 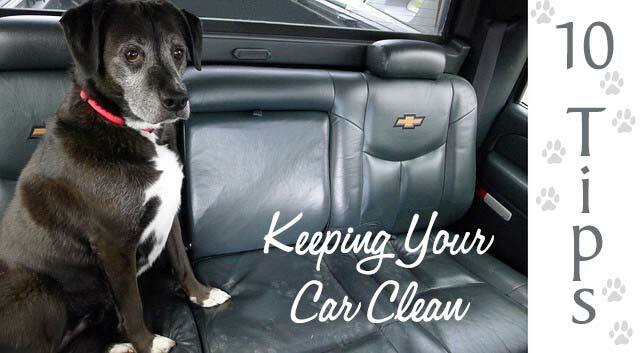 To keep doggy odors out of your vehicle, clean your car right away when you get home. Remove the seat cover or quilt and wash if necessary and make sure to ventilate the car well if any areas got damp from your pup’s adventure. A small Shop-Vac with a crevice tool is perfect for vacuuming any pet hair left behind and ArmorAll and Windex wipes quickly take care of any dirt or nose prints left on windows. If any odors remain, sprinkle the area with baking soda then vacuum up after 24 hours or use Febreeze spray to freshen upholstery or carpet. Using seat covers will keep most of the pet hair off your upholstery and lint brushes or adhesive lint rollers can help remove any additional stray hairs. If your dog’s fur seems to get stuck in the fabric of your seats, a ScotchGard-like fabric treatment may help seal the fabric and free you from spending an entire weekend using tweezers to remove those pesky stray hairs. For hair embedded in carpet fibers, put on a pair of household, rubber gloves and rub your hands over the carpet to pull up and remove the hair or try the fine-grain pumice stone method used in the video below. Yes! You can take your dog on car rides and adventures all summer long without your vehicle becoming a stinky, muddy furmobile. With a little planning, and armed with your cleaning kit, you’ll always be prepared for the worst. Then, by taking just a few minutes to clean your car when you get home, your vehicle can still be a pristine, sweet-smelling ride for your next night out on the town. Got any tips for keeping your car clean? Share them in a comment below! Are Dog Parks Good or Bad for Your Dog? A tee shirt is a terrific idea! We use a squeegee to pick up the dog hair and it works great. I’ve heard of the squeegee idea before but I haven’t tried that yet. I’m going to have to pick one up soon and check it out! Thanks for reminding me, M.K. ? We have seat covers and cargo liners that work great. Now that Katie, the eternal shedding dog, doesn’t travel with us the car stays much cleaner. We are not big shedding dogs so the covers are all we need. I bet Mom’s thrilled you don’t shed very much. I’m glad the cargo and seat covers work perfectly for you, Emma! “Stubborn Dog Hair” is right! I’ve been driving down the freeway at 70 mph, opened both windows, and been engulfed in a cloud of loose hair as it gets blown out the window. Then I look at the dash and the headliner and the fur is just sitting there without a care in the world! Haha! That reminds me of when my sister and her family took their golden retriever on a weekend trip while she was shedding heavily. When they all got out of the car, they were covered with golden fur, lol! ? Thanks, Jeanne! I’m glad you found the tips to be helpful. ? We stick to one car whenever our pup comes along. Great tips here! That makes it much easier, doesn’t it Rachel? Thanks for stopping by today! My golden retriever Savanna sheds buckets of hair when I take her in the car. I never thought of using a t-shirt on her but that might help. Thanks for the tips! You’re quite welcome, Rachele! You’ll have to let me know if the t-shirt idea works with Savanna. Great tips, I like the tshirt idea. My car is disgusting with my dogs riding in it. I can imagine! 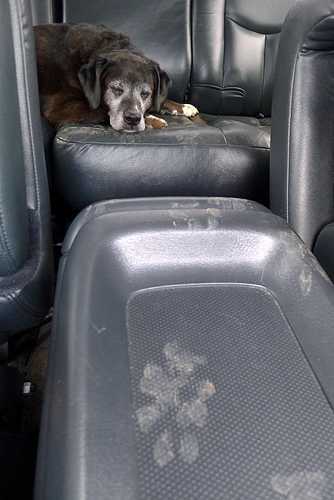 It’s sometimes a job cleaning up after Haley, but if I was taking more than one dog in the car very often, I would probably just surrender to the hair and mud, lol! T-shirts are a great idea. Also, limiting dogs to one car if you have several cars. The t-shirts would really help for those super shedders or dogs that blow their coats a few times a year. I use rug mats over carpet in my RV and Van. However, there are tricky strips and corners of carpet that remain exposed and irritatingly collect hair and dirt. I hadn’t thought of adhesive carpet film for those spots, thank you thank you for your tips!! I wish I would have thought about the carpet film when our vehicle was new. Oh well, I’ll definitely do that with our next car! Awesome tips! My two ride in their crates in the car, since they tend to pace and pant and otherwise be distracting. Cleanups are a snap, as I just hose the crates out. But I’ll be sure to share this with my buddies who have big dogs that travel in the back seat. Thanks for sharing the post, Jean! Crates seem like the perfect option, especially for smaller dogs. Crates They are safest and cleanest way to take your dog everywhere!! Lol! I can relate to that sometimes, Dolly. ? Excellent tips. We just got a new car, but didn’t trade in the old one, so we can keep the new one dog-free as long as possible. Great idea, Kari! That’s what we did too with our old Jeep Liberty. Haley likes it much better than our new vehicle too. 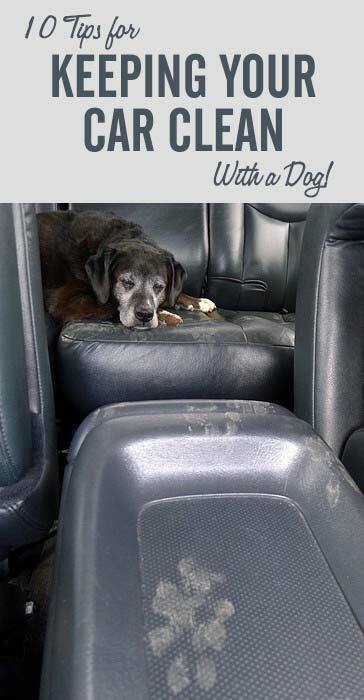 What a great tip for cleaning car seats – our dogs ride in crates and I still don’t understand how the car is so full of hair and dog slobber! That dog hair has a life of its own, doesn’t it? I’m always amazed when we go out to dinner and I look down and there’s a Haley hair on the table from my shirt, lol! ? These are some great tips! Thank you so much! Carpets are the worst!! When we got James (or 4th and last family member), I had to swap my car for a little van! The things we do for our pets!! Lol! I can relate to that, Valerie. Like Kari mentioned, we kept an old car just for when Haley rides with us. Mr. N isn’t too bad but he leaves smudge marks on the windows. Those are kind of cute, aren’t they? Like little nose kisses or something. ? I have one more to add to your incredibly thorough list – drop cloth! Jaxson threw up while we were driving out of town. Drop cloth could have saved the floor mats! Yes! I felt so bad for you and Jax when reading your post. Haley’s never thrown up in the car, but that can’t be a pleasant experience. Great advice! Will be sure to use this in the future, thanks for the share! Thanks, Celia! And thanks for stopping by today. ? Great tips. We do a lot of these – but the main one is that we always transport the dog in MY car, never the hubs’. Might have to try the tee thing. Rita loves short car rides but has started to hate long ones. (Which is a total bummer.) So maybe if i put her in her Thundershirt on long rides it will have the same effect. 🙂 Never thought to protect the carpet… What I do is, if an actual human has to ride in the back, I just take the floor protectors out. Instant dog hair removal! One other thing… you can buy door protectors. I have them in my car and wrote a review a while back on my blog. (http://www.poochsmooches.com/2014/01/scratches-and-drool-on-your-car-doors.html) When they were new they stayed in much better. Now if Rita sees another dog and scratches at the door, unfortunately they fall out! Need to try to find a way to get them to stay in place better. I can relate to the feeling you get when you have to unexpectedly give someone a ride in the “dog car”, lol! Thanks for sharing the link to your post about the door protectors. I’ve never seen those before and they would really come in handy, especially for droolers and dogs that scratch. ?? We definitely have to keep on top of cleaning the car, especially in Summer! My dogs are always in wet grass, mud and all kinds of other icky stuff, tracking it into the car. I like the tee shirt idea, thanks for the tips. Thanks, Cathy! I hope the t-shirt idea works for you. It really helps during Haley’s bi-annual shedding phases, especially for longer car rides. I’ve given in and decided the car belongs to the dogs. As puppy raisers we have dogs in our car more often then not. One hint I can give everyone is to try and get a dog that matches your car interior. While it doesn’t make you car any cleaner it at least makes your car look cleaner. If I had multiple dogs or raised service dogs, I would probably surrender the car too. That’s a lot of work to enjoy a clean car for about 5 minutes, haha! It’s funny you mentioned matching the interior because with Haley being black and white, I really can’t win but that’s a great idea for solid-colored dog. ?? My car has nose prints all over and is stocked with treats and poop bags!! Haha! It’s so smart to have a well-stocked car. We always have poop bags, but Haley might have to sniff around to hunt for a treat that fell down between the seats. ? It might be the most obvious of the list but I couldn’t agree more with sticking to one vehicle. We have our recreation passports on one of our cars for that reason, that way we only have to stick to cleaning up one car afterwards….when the inevitable mud, dirt, hair & slobber happens. It also makes it easier by keeping all those dog related things stocked in the dog car too. Poop bags, leash, treats…they’re all ready when you need them! ?? That pumice stone method is a clever way to get rid of hair – I’ll have to try that. The pups only ride in my Jeep on the back seat area, which is covered with a car hammock. We bought it back in 2011 and while it’s slowly starting to show signs of wear & tear, it’s still effective in keeping the car amazingly clean. It can be tossed in the washer no problem and air-dries within about an hour. You’re quite welcome, Barbara! I really appreciated your research on crates and harnesses that actually are safe and effective. Hopefully more of the vehicle containment products will be safety tested and rated soon. ? I am a big fan of using a seat cover in the car. I love to go hiking with my dog and it the weather doesn’t always cooperate with me. This means muddy paws all over my car. The seat covers are so much easier to clean than the actual seats of the car. Also, thanks for the tip about using a t-shirt to reduce shedding in my car. I will have to do this next shedding season. They are definitely a necessity if you do a lot of hiking with the dogs, especially when they decide to suddenly dive into a lake or roll in a mud puddle, lol! Happy Hiking, James! Has anyone tried mosquito netting to keep fur from flying around? I haven’t thought of that, Margaret. Would you hang it between the cargo area and the seats to keep the hair in the back area? That might work really well. ? By MidWest for my Honda SUV and cover it in a clear mesh netting to contain the dog hair. I really like your tip about cleaning your pup before getting back in the car after hiking. My husband and I are avid hikers and sometimes take our lab with us only to come back with a really dirty car. I will be sharing these tips with my husband to help us have a cleaner car with our dog. Thanks, Deedee! We’ve had a lot of those hiking trips early on and ended up with a car full of mud. I guess we learned the hard way, haha! ? We use the K9 Clean Portable Dog Shower. It hangs from your car window making it easy to rinse off mud and sand from your dogs before they jump back in the car. Its gravity fed too so its awesome for dogs that are afraid of water!